A BOMB has gone off outside the home of a leading Greek capitalist and banker. Says From The Greek Streets: "At approximately 8.30 pm on Wednesday, a bomb exploded outside the house of ship-owner Nikos Tsakos in central Athens, near the Acropolis. 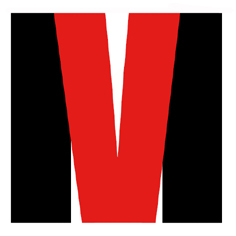 A yet unnamed group called a newspaper to warn about the bomb, but has yet to issue a communique." Until recently, Tsakos served on the board of directors of the Bank of Cyprus, where the population is the latest victim of the neoliberal system. A comment on the YouTube video of the blast declares: "This is the start of the world revolution." 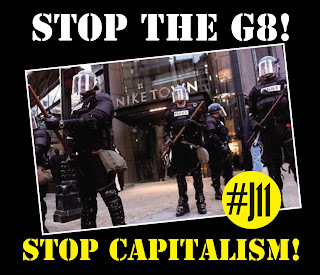 A CARNIVAL Against Capitalism has been called for London on June 11 2013, in the build-up to the G8 summit being hosted by the UK government. 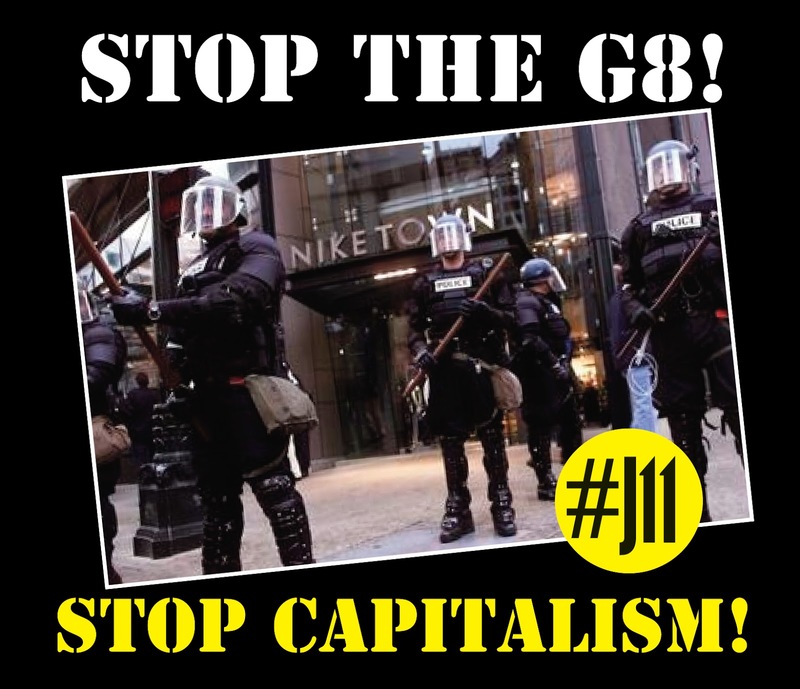 Stop G8 has announced the J11 date as part of a week of anti-capitalist and anti-militarist action in the British capital. It says on its call-out page: "London is right at the heart of global capitalism. And the West End of London, including elite areas like Piccadilly, Mayfair and Knightsbridge, is where power and greed are most concentrated." * Corporations. Many of the world’s most brutal and polluting companies, including oil and mining giants, arms dealers, and the businesses profiting from cuts and privatisation. * Vulture funds. Global base of the “hedge fund” and “private equity” industries, laundering the world’s blood money to invest in war, food speculation and debt slavery. * Tyrants. Government offices, embassies, cultural and commercial fronts of colonial powers and murderous regimes. * Playground of the mega-rich. Middle Eastern dictators, Russian mafia oligarchs, and home-grown parasites all see London as a “safe” place to hide and spend their loot. 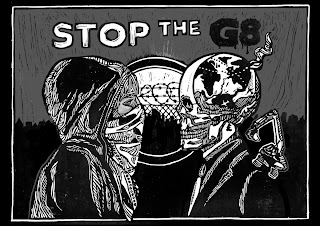 Explaining the carnival theme, Stop G8 says: "Traditionally, carnival is the time where the people take over the streets, the bosses run and hide, and the world gets turned upside down. It is a time to celebrate our resistance and our dreams, to bring music and colour to the streets. And also to show our strength and our anger. "The powerful feel safe in London so long as they go unchallenged. But the people looting our planet have names and addresses. On #J11 we will party in the streets, point out the hiding places of power, and take back the heart of our city for a day. Our streets. Our world. "Join us. Like any good carnival, everyone’s invited: this will be an open, inclusive, and lively event. There will be a main route with sound systems and public meeting points. Bring music, costumes, banners, friends, ideas. We also encourage independent actions, and will publish soon a detailed map of the area to help you make your own plans. The Green and Black Cross group will provide experienced medical and legal support." 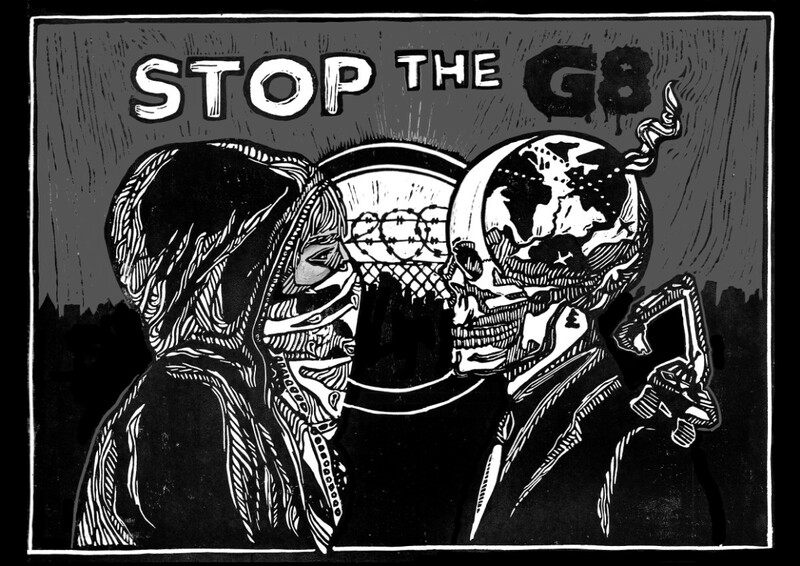 Direct action newsheet SchNEWS reports that protest plans for the G8 are mushrooming, with separate groups planning action in both Dublin and Fermanagh following the London week. It says: "The powers-that-be must have been so chuffed with themselves when they came up with their cunning game plan for this year’s G8 summit, hosted by the UK government. "By holding it near Enniskillen, in County Fermanagh, in the north of Ireland, they thought they would kill two birds with one stone - shrugging off those pesky protesters expected on the mainland and showing off to the world how they had got the six counties nicely pacified and under control. "But things haven’t exactly gone to plan. First there was the rioting by Union Flag-loving parts of the population, which made many locals wonder if taking on another security headache was the wisest course of action they could have come up with. "Then there were the reported threats to the summit from dissident republican groups who, unlike us unwashed anti-capitalist hordes over here, tend to be armed. "And now there has been a flurry of excitement in the run-up to the summit in which it appears that there will now be three centres of protest across an eight-day period and spanning two different states. Hardly the easy ride the G8 were hoping for!" And anarchist blogger Paul Cudenec has called for fellow anarchists to put aside any theoretical objections to summit protests as a means of resistance, insisting that "capitalism exists on many different levels and should therefore also be countered on many different levels". RURAL rebel fighters in India appear to be moving into new territory, sending authorities into a state of panic. The Deccan Chronicle reports: "For the first time, Mysore dis­trict is in danger of becoming part of the Red Corridor—a term used to describe the land stretch from Bihar to Karnataka where the left-wing extre­mists have a presence." And The Times of India says: "The Anti-Naxal Force, the elite commando force fighting Maoists in Karnataka, is extending its area of operation to Mysore district following apprehension that Naxals could extend their base to forested areas in Mysore and Chamarajnagar. "After sighting of Naxals in Kodagu forests, the ANF on Sunday moved its commandos to rural Mysore, which the senior police officials described as preventive measure. The ANF is opening a temporary camp at Beemanakolli in Heggadadevenakote taluk, one of the most backward taluks in Karnataka. "Though the combing operations were planned to start on Sunday, it was put off. The ANF commandos are likely to start the groundwork from Monday and scan the forested areas, particularly those pockets that forms border with Kerala. "The 100-plus force is stationed at Beechanahalli in H D Kote where ANF held a joint meeting with Mysore district police and forest officials. A joint meeting of the cops from Kerala and Tamil Nadu too was held for better coordination. The ANF commandant Vasudeva Murthy has arrived to chalk out strategy. Mysore SP R Dileep visited the area." REBELS in Germany and elsewhere are hitting back at fascistic CCTV surveillance - and turning it into a new online "game". UK anarcho news site Schnews reports that the "Camover" trend is taking the Germany's cities and the internet by storm, with players masking up and using anything from axes to lassoes to put the cameras out of action. It says: "The game originated in Berlin, where anti-CCTV feeling has been brewing in the radical circles. Attempts at more standard protest, including a small march and film showings, made little impact, so a black bloc took to the streets one night to take more shady direct action. Now participants are getting in on the game from Finland, Greece and the US."